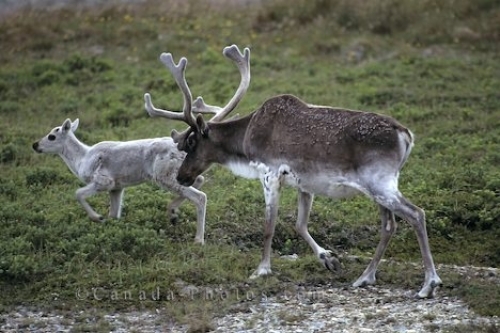 A male Caribou takes care of the snow white colored baby as they make their way across a grass field after grazing on the greenery. As winter nears, the coat of the male Caribou changes to white as he sports a full rack of antlers and the baby is already white in color. They remain as a tight knit family until the youngster is ready to venture out on his own. Picture of a small family of Caribou which includes a male and baby in the wilderness of North America.